Three front engine, FWD Euros. Two from Svenska, one from Deutschland. All three with stick shift. 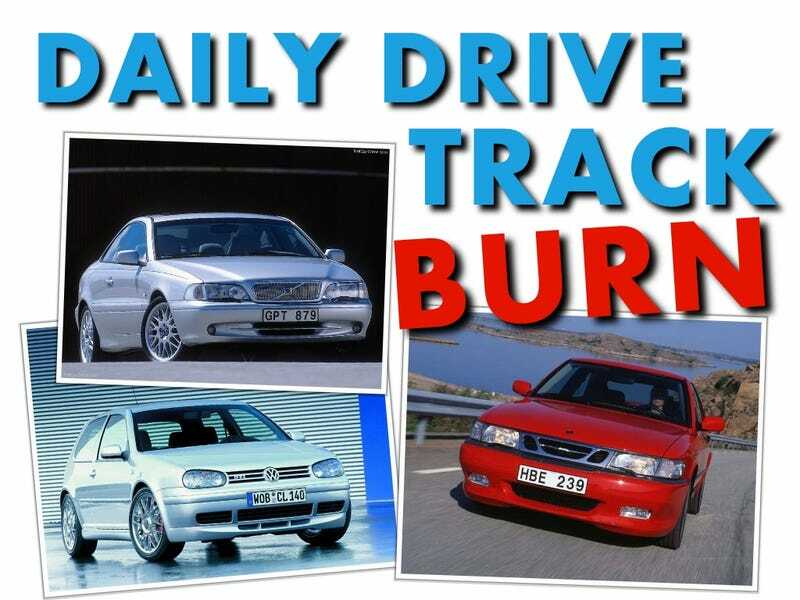 You know what to do — DD Track Burn starts right now. The C70 T5 Coupé is a front wheel drive car with a front-placed engine, sold by Volvo. It's powered courtesy of a turbocharged engine of 2.3 liter capacity. This powerplant features double overhead camshaft valve gear, 5 cylinder layout, and 4 valves per cylinder. The Saab 9-3 Aero is a hatchback with 3 doors and a front-mounted engine which transmits the power through the front wheels. Power is supplied by a double overhead camshaft, 2 liter turbocharged 4-cylinder engine, with 4 valves per cylinder. This car has a 3 door hatchback type body with a front positioned engine delivering power to the front wheels. It is powered by a turbocharged engine of 1.8 liter capacity. This powerplant features double overhead camshaft valve gear, 4 cylinder layout, and 5 valves per cylinder.